Save 20% at Wild Rose's Thank You Sale! 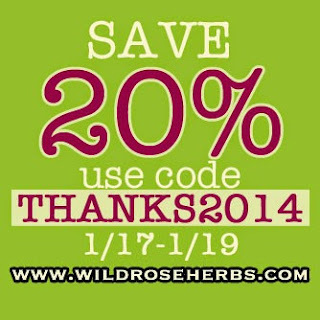 Home / Blog - Wild Rose Herbs / Save 20% at Wild Rose's Thank You Sale! Happy 2014! Wild Rose is celebrating with a 20% off sale. Use code THANKS2014 at checkout through January 19th to save! Be sure to keep an eye on our Facebook, Twitter and Instagram pages for the latest on sales and giveaways. Or, sign up for our newsletter and never miss a special!